Pancake Day, which falls on 12th February this year, is being celebrated at all four branches of The Breakfast Club with a special 'Man Vs. Pancake' style competition, with a speical race starting at 7.30 in Hoxton and Spitalfields... For those not into competitive eating, pancakes will be on the menu all day at all four cafes, so you can eat at a more leisurely pace. "Calling all competitive eating aficionados; the Annual Breakfast Club Pancake Challenge is back to raise money for Rays of Sunshine Children’s Charity. Come and stuff your face all Pancake Day long in our four cafes. The rules are simple: 12 pancakes in 20 minutes. If you win, it’s on us. If you lose, you’ll pay full price and all profits go to Rays of Sunshine. And this year we’re cranking it up a notch with our very own Man V Pancake style competition at our Hoxton and Spitalfields cafe. If you think you can eat six pancakes in record time then join the big boys and enter yourself into our Pancake Race at 7.30pm. 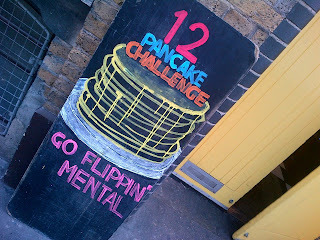 Those crowned King or Queen of The Pancakes will win dinner and drinks for themselves and up to six mates on the night. To enter email Ferris@lovetbc.com with a Pancake Race competitors name and which cafe you wish to compete at (Hoxton or Spitalfields only). To help us raise money for Rays of Sunshine, get your friends and family to sponsor you and we’ll give away a prize to the person who raises the most money. Dressing up is also encouraged with prizes to be won for best dressed competitor. For those who’d rather not eat their pancakes against the clock we’ve put together a selection of the finest pancake toppings, from the classic traditional to the downright weird. Full menu to be revealed soon." Tickets - reserve your place by emailing Ferris@lovetbc.com with a Pancake Race competitors name and which cafe you wish to compete at (Hoxton or Spitalfields only).